Back to the future in great style for the Amarone Fieramonte Allegrini. On Friday 29th September, the new vintage of this historic Amarone Classico Riserva DOCG took flight. 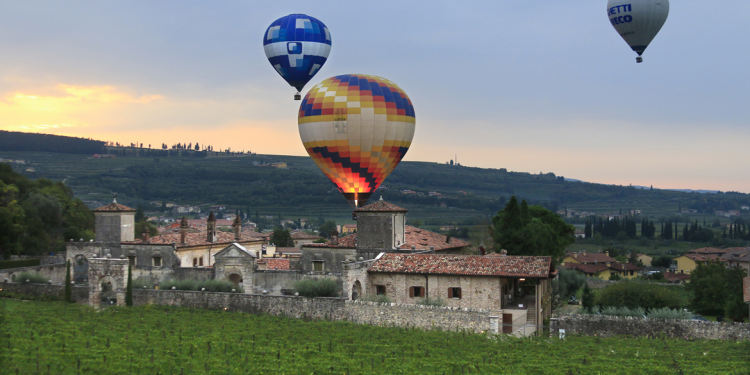 It is produced in Fumane (Verona) and is on the market again after 32 years, which was symbolically celebrated with a hot air balloon ride over Valpolicella. The 2011 vintage of this Riserva has a limited edition of 5000 bottles and about 600 magnums. Villa della Torre, where the presentation gala dinner was held, was decorated for the occasion with spectacular waves of light: reminiscent of the level curves of the hill where the vineyard in Mazzurega is located. These lines have also inspired the black and white packaging. The grapes that make the Amarone Riserva Fieramonte are grown at 420 metres of altitude in a cru of 6 hectares dominating the Fumane valley. It is here, above Villa della Torre, that the Allegrini family produced a powerful Amarone, both in terms of structure and aromas, until 1985. They reluctantly had to stop producing due to a disease in the vineyard. In 2001, they replanted new vines (mainly Corvina and Corvinone) here, replacing the Pergola training system with double Guyot and adopting a high planting density. The Amarone Classico Riserva DOCG Fieramonte is made from a selection of Corvina (45%), Corvinone (45%), Rondinella (5%) and Oseleta grapes (5%). After grape drying, the wine rests in barriques for 36 months, followed by 18 months of pre-bottling storage and 2 years in bottle. “It has never been our philosophy to base the wine on extract, but rather to make a wine that identifies with the second skin we feel we are wearing, which is the Corvina grape,” explains the winemaker Franco Allegrini. When tasting the 2011, which has an alcohol content of 16.5% vol, it comes through powerful, as we would expect, long-lived and it unfolds gradually: red fruit slowly gives way to tertiary spicy notes such as black pepper, cloves and hints of bitter chocolate.